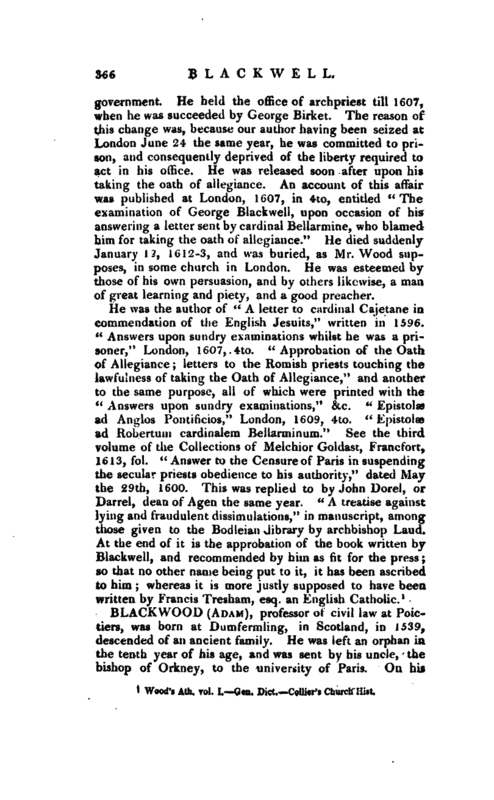 , a learned English writer of the church of Rome, in the beginning of the seventeenth century, was born in the county of Middlesex, and admitted a scholar of Trinity college in Oxford at seventeen years of age, May 27, 1562, probationer in 1565, being then bachelor of arts, perpetual fellow the year following, and master of arts in 1567. But being more inclined to the Roman catholic than the Protestant religion, he left his fellowship, and retired to Gloucester hall, where he continued for some time, and was highly esteemed by Edmund Rainolds and Thomas Allen, two learned seniors of that hall. He afterwards went beyond sea, and spent some time in one of the English seminaries newly erected to receive the exiled English catholics andwas at last in 1598, with the permission of pope Clement VIII. constituted by Henry cardinal Cajetan, protector of the English nation at Rome, and superior of the English clergy, with the authority and name of Archpriest of England, and was appointed by that pope notary of the apostolic see. This affair being resented by the English catholic clergy, especially as they imagined that our author was absolutely under the influence of Henry Garnet, provincial of the Jesuits of England, it occasioned a warm contest between them in England. The Jesuits wrote and spoke against the secular priests in so virulent a manner, as to detract very much from BlackwelPs authority who upon this degraded them of their faculties, so that when they afterwards appealed to the pope, he caused them to be declared in a book schismatics and heretics. They vindicated themselves from this charge, and procured the censure“of the university of Paris in their favour; which was answered by our author. He also declared his abhorrence of the Powder Plot in 1605, and wrote two letters to dissuade the Roman catholics from all violent practices against the king and | government. He held the office of archpriest till 1607, when he was succeeded by George Birket. The reason of this change was, because our author having been seized at London June 24 the same year, he was committed to prison, and consequently deprived of the liberty required to act in his office. He was released soon after upon his taking the oath of allegiance. 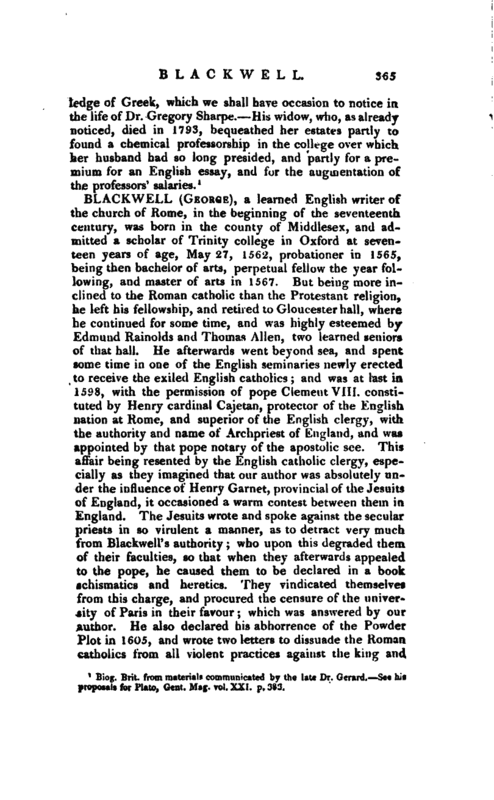 An account of this aft’air was published at London, 1607, in 4to, entitled” The examination of George Blackwell, upon occasion of his answering a letter sent by cardinal Bellarmine, who blamed him for taking the oath of allegiance." He died suddenly January 12, 1612-3, and was buried, as Mr. Wood supposes, in some church in London. He was esteemed by those of his own persuasion, and by others likewise, a man of great learning and piety, and a good preacher. Wood’s Ath. vol. I.—Gen. Dict.—Collier’s Church Hist.